Along with the creative aspect of marketing, R&D, and competitive analysis represent vital essentials to understand the end user or consumer. Without the proper research, a possible great creative campaign may not convey the right information to the client’s core or new target audience. I possess experience in marketing data research for a variety of B2B and B2C companies, worked with many demographical research companies, and used software utilities to develop major campaign platforms. Statistical data and analytical metrics can back an overall campaign and add credibility to the client. The Objective: SIPR looked to develop a report study that was well designed and contained demographical data based on core target audiences within the State of Indiana. 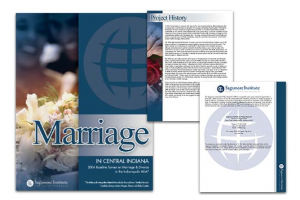 This report was submitted for governmental funding on marriage counseling and other programs. The Solution: By creating a marriage survey based on a core demographical areas within Indiana, as well as, using Census data and Scarborough (Arbitron) research, we were able to concentrate on the root cause of divorce in Indiana. Once the research was compiled and tabulated, I generated the content for the study and designed a report for submission to the Indiana State Government. The End Result: After report submission, the Indiana State Government funded a grant for SIPR that developed state wide counseling service programs for individuals. 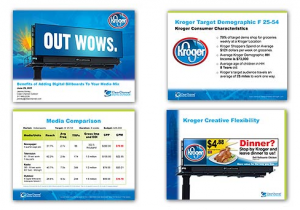 The Objective: In the past, Kroger purchased bulletin rotary programs and poster Quick Hit showings to try and reach full market penetration within their key demographic W 25-54. This became very costly due to production, based on holidays and multiple promotions throughout the year. A full digital network buy would fill the need to promote multiple products and holiday promotions minus the vinyl production costs of switching out bulletins. The Solution: The Account Executive and I sat down and determined their overall media spend, including production, space costs throughout the year, and creative campaigns. We developed a campaign presentation for Kroger based on their target demographic and using dynamic content as a key feature excluding the production costs. The idea was not to lose the bulletin business, but add to their current media mix of outdoor and increase their reach and frequency across the market. The End Result: We proposed the concept to Kroger’s agency and they loved the idea of digital flexibility without the costs of vinyl production. In Q1, they purchased a 24-week digital network campaign flight in 2 and 4-week intervals, promoting current sales and holiday promotions. The overall sale digital network campaign and design grossed over $60,000 in digital network revenue. The Objective: Conner Prairie believed their media buy of newspaper and broadcast reached their entire target audience and saturated the market. 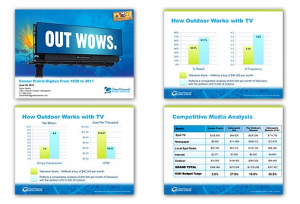 The client cut outdoor out of their budget due to the recession in 2009 and never added it back into the overall media mix. The Solution: The Account Executive and I knew Conner Prairie was getting ready to launch a new living Civil War exhibit. We created a presentation with two objectives: Re-introduce them to outdoor products and propose a digital dynamic content countdown creative promotion for the new living museum Civil War exhibit. This strategy would enhance their broadcast and print media buy by increasing their reach and frequency. The overall program would lower their CPM/CPP and give them full market penetration. The End Result: We proposed the new media mix buy to Conner Prairie, re-introduced them to Clear Channel Outdoor and the digital promotional campaign. At that time, they had allocated their media budget for the current year. Where we succeeded, Conner Prairie re-introduced outdoor as part of their media mix for the next fiscal year during their media planning in June for the next fiscal year. The Solution: The Account Executive and I developed a digital network proposal to promote the launch of 3 new product lines while focusing on their target demographics for each product. 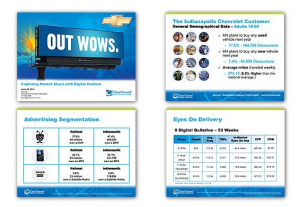 The proposal included the features and benefits of the Clear Channel digital network, research data of their target demographics per product line and vehicle buying habits, a competitive media spend, spec creative, and creative examples of The National Chevy Dealer Association Co-op in other markets and efficiencies. The End Result: The Account Executive and I presented the proposal to The National Chevy Dealers Association. 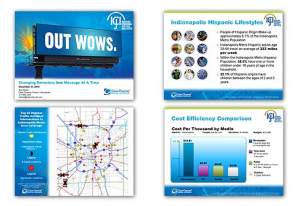 We succeeded in landing the new target account and they now budget digital outdoor campaigns within the Indianapolis Market adding to their media mix. The Solution: The Account Executive and I developed a digital network proposal he Ford product lines and focusing on their target demographics for each product. 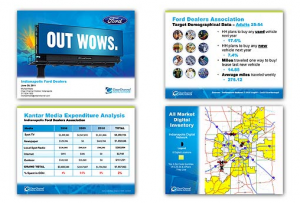 The proposal included the features and benefits of the Clear Channel digital network, research data of their target demographics per product line and vehicle buying habits, a competitive media spend, spec creative, and creative examples of The National Ford Dealer Association Co-Op in other markets and efficiencies. The End Result: The Account Executive and I presented the proposal to The National Ford Dealer Association Co-Op. We succeeded in landing the new target account and they now budget digital outdoor campaigns within the Indianapolis Market adding to their media mix. The Objective: Hoosier Park Racing and Casino purchased a long-term permanent digital outdoor ad spot on high profile unit and currently contract a permanent vinyl bulletin face. 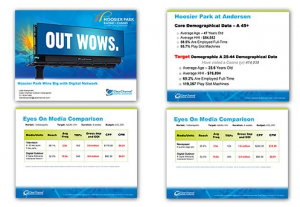 Knowing that one permanent digital spot and bulletin will not give Hoosier Park the reach and frequency they are looking for in a long-term outdoor campaign, we needed to provide them with other options to enhance their ROI. The Solution: One of the client objections focused on the location of Hoosier Park in Anderson and the location of the Indianapolis digital network. To combat this objection, we did a research study of their core and target demographics with where they lived, worked, and driving patterns. Then, developed a map showing the data in relation to our digital network. Next, we took their prior year media budget and shifted dollars from newspaper and broadcast spend and created an 18% spend allocation for the digital network. This was money already spent, but by shifting around their media mix dollars, we weighted the media to include the extra digital spots and keep the current permanent bulletin within the same budget. Along with spec creative, we introduced social media and dynamic content, and showed Hoosier Park the features and benefits of this new media mix. Overall, we enhanced their efficiencies with their current media spend. The End Result: We presented the proposal to Hoosier Park Racing and Casino and they were highly impressed in our abilities to reallocate their media dollars, include the digital network and keep their current media budget. After the presentation, Hoosier Park worked with their agency to re-budget their media mix to add in the full digital network. The Objective: ICJI represents a current account with (CCO) utilizing a multiple flight poster program throughout the year. 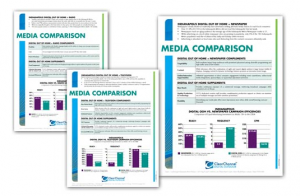 Over the year, purchasing all of the poster showings adds a multitude of production costs to their limited media budget. The Solution: The Account Executive and I worked up a proposal adding the digital network to their current poster buy to enhance market penetration on key surface streets and interstates. We included a Hispanic target demographic along with their current target demographic to increase the possibility of governmental funding. 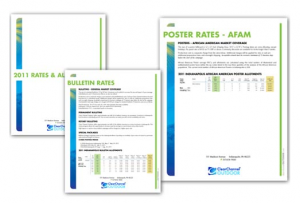 I provided the features and benefits that added the weighted efficiencies to their existing poster campaign. Also, I included out-of-home driving pattern research, we also included demographic maps where their current poster showing was located, digital network locations, and the highest crash sites in the Indianapolis Metro area. The proposal included spec art based on their current campaigns including: drinking and driving, child safety, and holiday drinking programs in English and Spanish. The End Result: We presented the proposal to ICJI and due to government program funding they were not able to purchase the full digital network, but were able to increase their poster showing from a 25 GRP to a 50 GRP. ICJI continues to look for governmental funding to add digital to their current media buy.